This article is a part of the ongoing Citizen-Politician debate series Mandate 2014 on LILA Inter-actions, the online debate platform of LILA Foundation for Translocal Initiatives. With the Parliamentary polls just round the corner, a curious simultaneity is playing itself out in Indian politics. Thanks to the perceived corruption and misrule of the UPA, the Gujarat model of development has become a legend, a myth that people would buy into, simply because they are desperate and see no alternative. Indeed, there is a despair in the polity today, which the BJP and its PM candidate are exploiting to the full by their stress on development. The irony of this situation is, most voters from the Hindi belt do not understand this model, nor do they know Narendra Modi as they would a politician from the North. Yet Modi’s specific advantage is that his emergence has coincided with the UPA’s ten-year anti-incumbency. The BJP’s history shows an attempt to balance the art of the possible with the goal of polarisation. The party has an enviable record in terms of alliance building. Under Atal Bihari Vajpayee, the NDA reached a peak of 22 allies. With Modi in command, this project has taken a knock; one of the BJP’s oldest allies, the JD(U), departed the NDA citing its inability to co-exist with Modi. However, the BJP’s PM candidate is slowly overcoming the resistance to his persona and has succeeded in achieving a few small but significant breakthroughs. The symbolism of Ram Vilas Paswan’s LJP returning to the NDA fold under Modi cannot be dismissed lightly. Paswan was the first to quit the NDA in protest against the 2002 anti-Muslim violence. 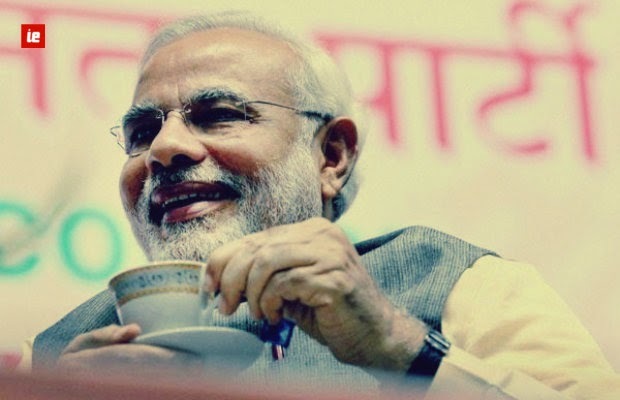 Modi is carefully using the card of modest origins the chai-wala with OBC background. On the other hand, the BJP’s philosophy is Hindutva, which thrives on polarisation. Reaching out and polarisation are contradictory impulses, and yet in a place like Uttar Pradesh, one can see both impulses at play, as the BJP attempts to expand its voter base while retaining its core vote. U.P. is central to the BJP’s calculation of achieving an overall Lok Sabha tally of 200 seats. It needs to win a minimum of 40 seats from the State if it is to reach the larger target. Towards this end, Modi has assumed multiple avatars: he is at once macho man and poor tea-boy with OBC origins. But Modi is also aware that this expansion could alienate the core vote, and thus also his reliance on confidant Amit Shah to keep the Hindutva cinders burning. Shah has been promising the Ram mandir; he has also lent covert support to the polarising project in communally sensitive places like Muzzafarnagar. So, the perception that the BJP under Modi is shifting to the middle ground is, in my view, incorrect. Today, as before, the BJP wants to attain power. The mission may look easy, especially with the growing popular support for Modi. However, the Gujarat Chief Minister is not merely a polarising figure, he is authoritarian with almost no tolerance for dissent. The BJP’s earlier stint in power was made possible by Atal Bihari Vajpayee being at the head of the NDA. Vajpayee is, even today, very popular, and his USP is his ability to adapt himself to the demands of a situation. Thus he could at once be a moderate with his allies and play the Hindutva card while appealing to the core voters. Besides, at that time, there was the Vajpayee-Lal Krishna Advani compact, by which the former appealed to the moderate sections and the latter to the core constituency. moderate image for the party. Will Modi manage the same on his own? Now, in the absence of Vajpayee and Advani, Modi has the tough job of combining both in his own identity. Modi’s inflexibility makes the task that much harder. Recently, BJP chief Rajnath Singh offered Muslims what seemed like an apology for past mistakes. However, soon thereafter, he retracted and tweeted that the Congress needed to apologise, not the BJP. Modi has not even gone this far. When, last year, Reuters asked him if he regretted the 2002 violence, he took refuge in generalities, and gave the analogy of a puppy coming under a car. Modi is aware that a fair bit of his appeal derives from his muscular, macho, anti-Muslim image. He will not want this diluted. In other words, the occasional conciliatory gesture he and the BJP under him make towards Muslims cannot be taken as a genuine change of heart. And yet India is a country of such spectacular diversity that no party or alliance can sustain itself in power without treading the middle ground. Vajpayee achieved this by a combination of his own middle-of-the road image and taking into the NDA, parties which are fiercely secular in character. The participation in the NDA of Mamata Banerjee, Nitish Kumar and Naveen Patnaik, all with large minority populations in their States, lent a measure of credibility to the NDA. The BJP’s Hindutva was balanced by the centrist orientation of the allies. The allies, who joined the NDA because of the ‘genial, accommodating’ persona of Vajpayee, started to exit from the same alliance post the 2002 Gujarat anti-Muslim violence. This establishes two things. One, the allies may be wary of the BJP’s Hindutva but they will align with it provided it has a leader capable of taking along everyone. Two, if the BJP flouts the compact by openly targeting the minorities, as happened in Gujarat and later in Kandhamal, the alliance will break. This is for the simple reason that beyond a point the allies cannot hurt their own vote base. On the election trail, it is easy to win appreciation by loud attacks on the Congress and jokes on the dynasty, but the BJP cannot replace the Congress, which for all its faults, has a liberal core. The one area where the BJP has traditionally scored over the Congress is in the area of internal democracy – the BJP’s claim is that it believes in collective leadership as opposed to the Congress’s reliance on the Nehru-Gandhi dynasty. And yet, if one looks at the BJP closely, one would find that it has always projected a single larger-than-life figure. In the Ram temple phase, it was Advani who dominated the party. 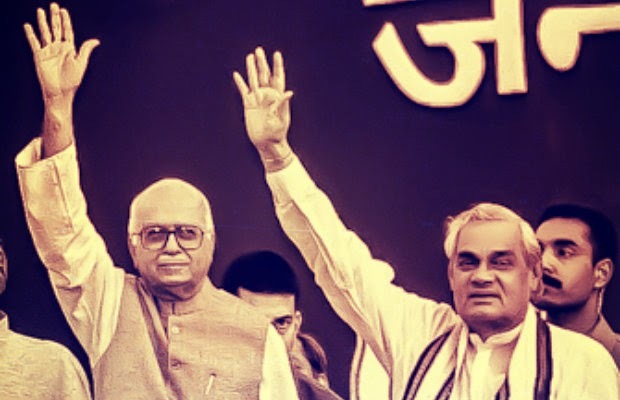 Vajpayee became the BJP’s winning mascot post 1996. It might be worth recalling that the BJP included 70 photographs of Vajpayee in its 2004 manifesto. There were also recorded personal messages from Vajpayee to individual voters. So the BJP’s projection of a single individual today is not a break from the past. 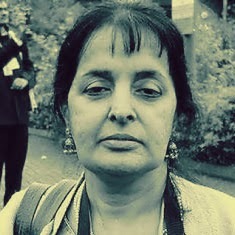 However, Modi is seen as someone who brooks no dissent, and party insiders worry that he would be intolerant of rivals. Two examples are often quoted to illustrate Modi’s power within the party: RSS pracharak Sanjay Joshi was ousted from an insignificant position in the BJP because he once dared to take on Modi; Advani, who had resisted Modi’s elevation to Prime Ministerial nominee, was completely isolated and was left with no option but to accept Modi’s leadership. Modi’s tremendous charisma and his offer of utopia via the Gujarat model are the reasons why he has become so popular today. His way of circumventing the image problem is by hardselling development, which, judging from ground reports, is paying him high dividends. However, if and when Modi gets into government, he will no longer be able to put off the question: how does he balance the Gujarat model – which in its essentials is corporate-driven development – with the requirements of social and distributive justice? The growth and development narrative worked wonders for Modi in Gujarat but India is a diverse country of many castes and communities, the majority of whom are poor. In fact, Modi in power has to reckon with the fact that subsidy and welfare have become state policy under the UPA Government. MNREGA and Food Security are measures that cannot be reversed. However, the corporate sector is backing Modi to the hilt precisely in the hope that he will opt for a high-growth, no-subsidy trajectory. The BJP tried to be centrist under Vajpayee and succeeded as long as the allies were able to pursue a common, non-sectarian agenda. The allies forced the BJP to exclude the Ram Mandir and other contentious issues. But in the aftermath of Gujarat 2002, and closer to the 2004 elections, they began to depart from the coalition out of deference to their own moderate constituencies. If the BJP under Modi touches 200 Lok Sabha seats, it is a fair bet that the party will able to get the bigger parties to join in. However, history shows that for a ruling alliance to sustain itself, its centre of gravity has to be in the middle.